We are all fond of Italian cuisine. We are also aware that not all Italian dishes are created equally, in the sense that you may find some bastardised version of an Italian dish somewhere in the USA but God forbid, never in Italy itself (read: Pizza Margherita with mozzarella). 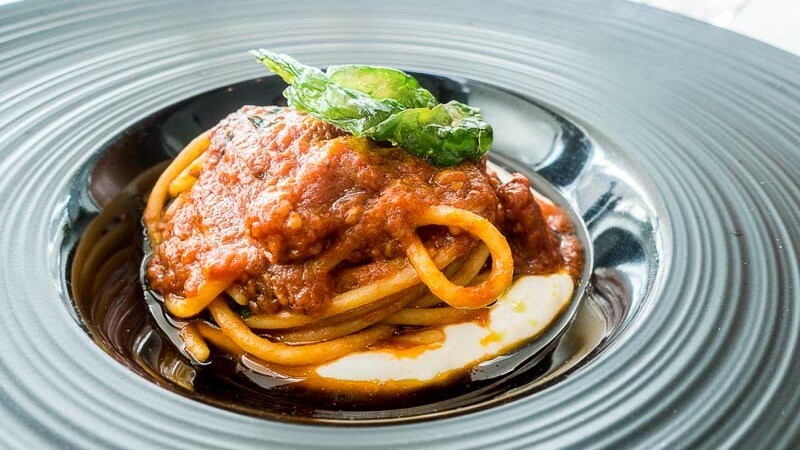 Italians are very proud of their rich culinary heritage, and rightfully so, as this piece hopes to explain better why you simply cannot have spaghettini with carbonara or tagliatelle with ‘sticky’ sauces. To simplify matters right from the start, think of it as having an appropriate utensil when eating certain dishes; you wouldn’t eat soup with a fork now, would you? 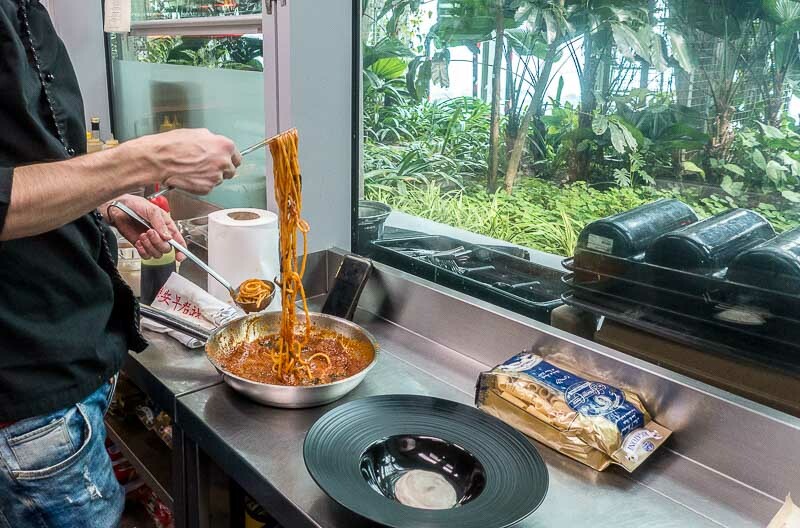 In the same respect, the shape and size of the pasta play an integral role in assisting the sauce to be delivered into your mouth in the most effective manner. It’s like pasta serves as a delivery vehicle for the accompanying sauce. I spoke with Chef Antonio Manetto and Chef Roberto Galbiati, co-owners of Acqua E Farina at Railway Mall. 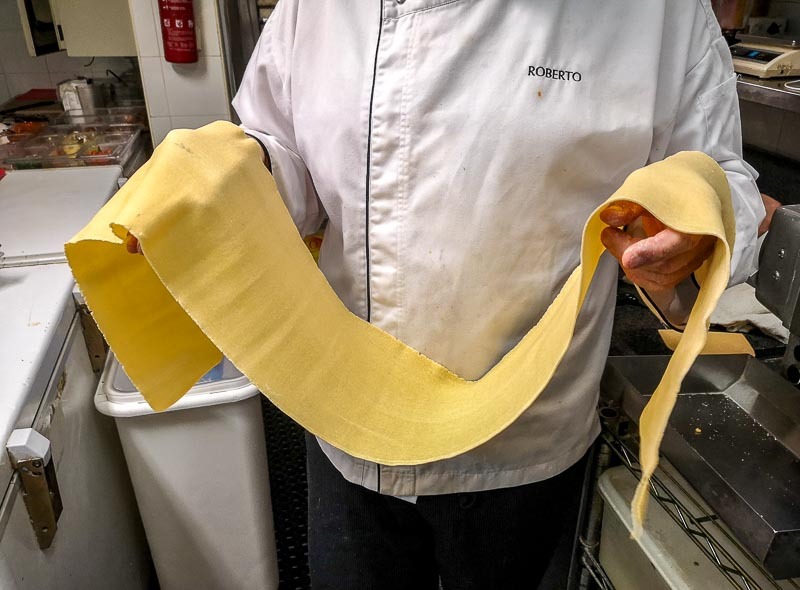 They make several kinds of fresh pasta daily on-site and gave me a quick low-down on how important pasta type is when pairing it with a sauce. 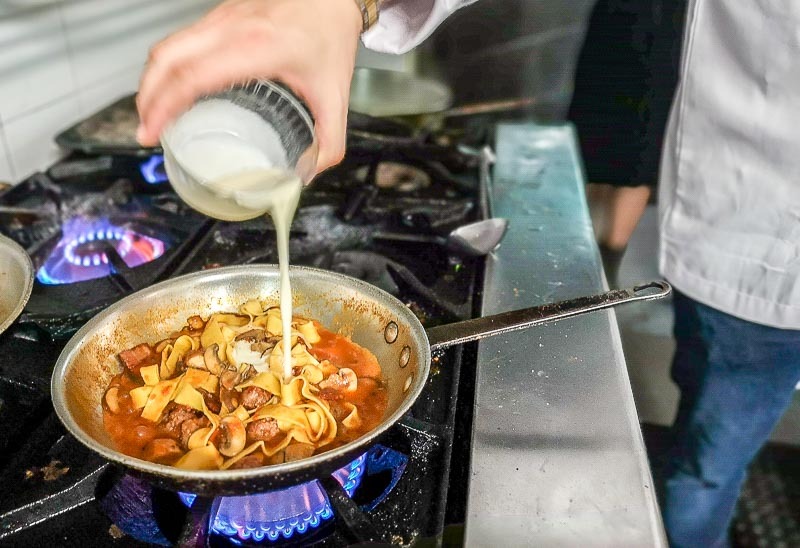 “It’s something we just learn as we grow up, and we just know what goes well together.” That left me not only without a concrete answer, but it also forced me to read up on what the general rule of thumb is when it comes to pasta-pairing with sauces. Chef Roberto then proceeded to whip up one of his specialities, tagliatelle with a Boscaiola sauce. The sauce is painstakingly cooked for two days using beef bones. 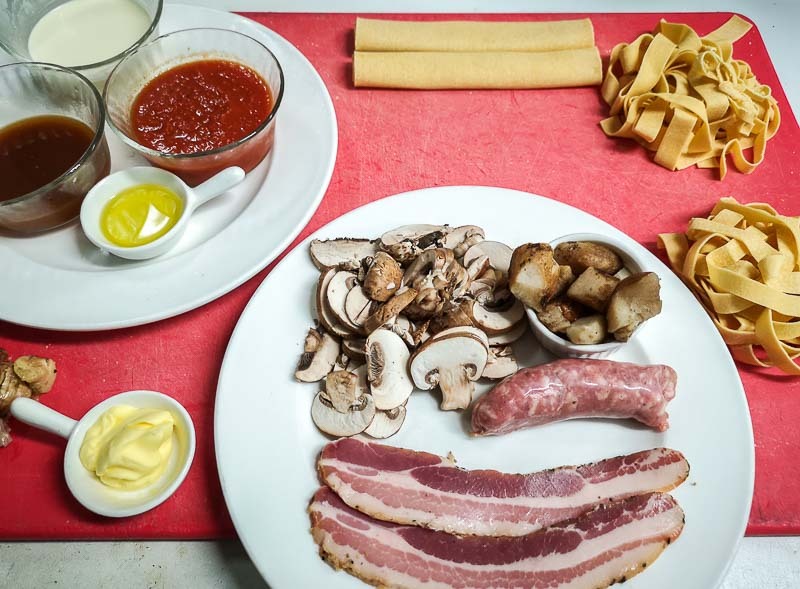 He added pancetta, mushrooms, Italian sausage, tomatoes and cream, ensuring that two pans are used to cook the pancetta separately to avoid the entire recipe from getting overly greasy. For those loving a comforting and hearty pasta dish, you’ll fall instantly in love with this. The sauce was thick and luscious, and the saltiness from the pancetta brought the entire dish together. The tagliatelle was smeared with Boscaiola sauce, and was satisfyingly chewy and soft at the same time. As I discovered, there are over 200 types of pasta, with cylindrical pasta like rigatoni and penne being the more versatile type, as they hardly stick together and enables sauces to get stuck within its cavity. 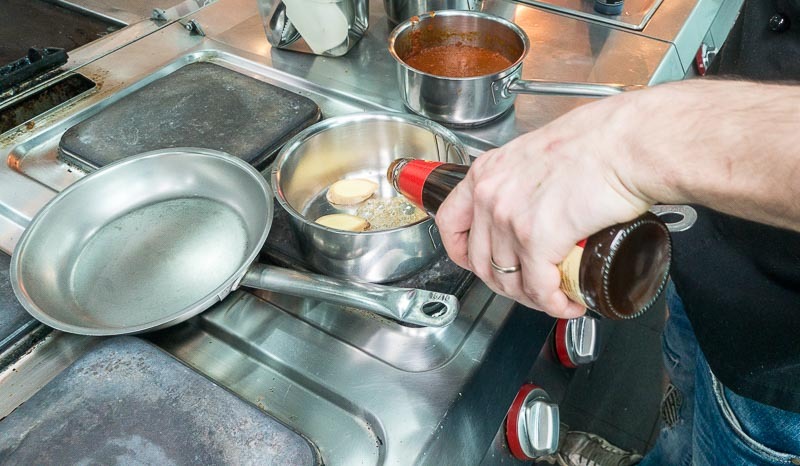 This means you’d more likely prefer a sauce that has density and thickness to it, with minced meat to boot, enabling it to be picked up within the cylinder. This rationale also works for long, cylindrical pasta like the very popular spaghetti. There have to be bits of meat and/or vegetables in a sauce that’s thick in order for it to coat the pasta thoroughly. How about gnocchi? A sticky sauce would suit it best, but be mindful to not overcook the gnocchi as this would result in a mushy, chewy dish. Wonder why angel hair pasta is usually dressed in an olive oil-based sauce? Simply put, due to its thinness, it shouldn’t be overwhelmed in a sauce. It makes sense to allow the pasta to shine and marry it with seafood or vegetables lighter produce that won’t weigh down the delicateness of the pasta. 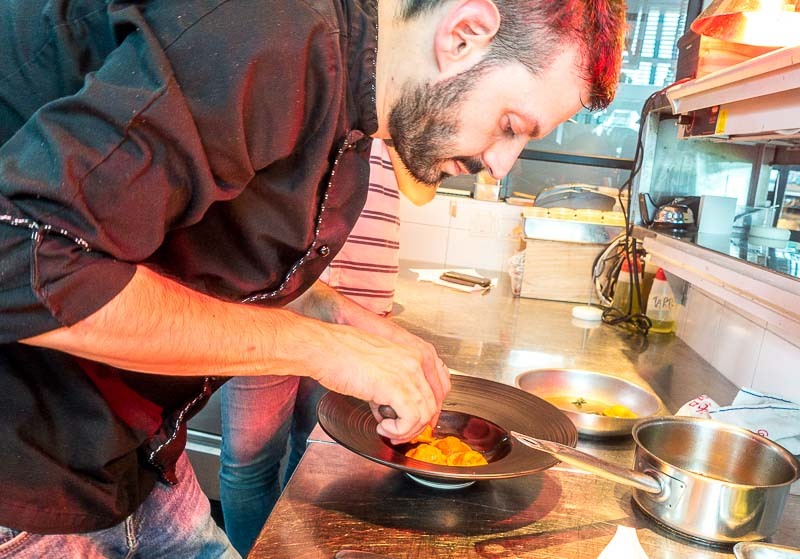 I also spoke with Chef Emanuele Faggi of Zafferano, hailing from Tuscany and has worked in the kitchen of Milan’s two-Michelin-star Cracco Ristorante by celebrity chef Carlo Cracco. He kept a casual disposition as he slinked across the kitchen from counter to stove, all while continuously listing out familiar and staple pasta dishes. “It’s very hard to say why this pasta must go with that sauce. It’s something that, as an Italian, you just know. Like you see on the menu, there’s usually a Penne Arrabiata or a Spaghetti Pomodoro,” he started off. 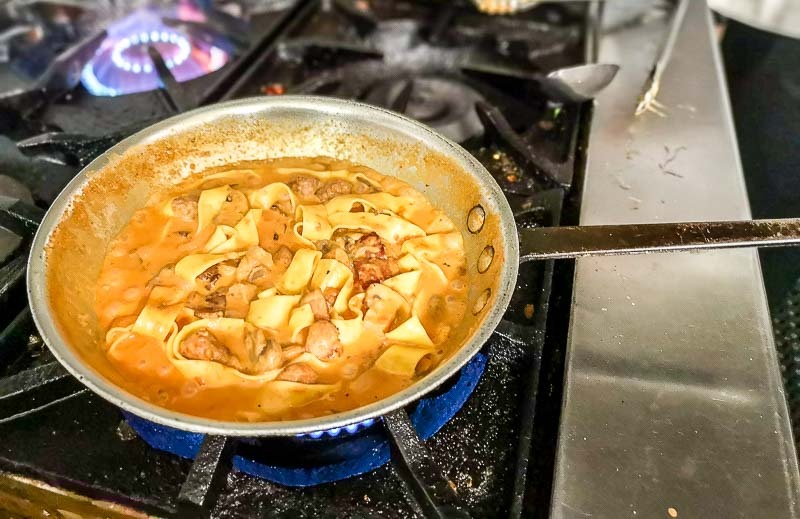 He elaborated on how there are simply some recipes that call for a particular pasta type, and hardly ever works with anything else; either the texture isn’t right (dry versus fresh pasta) or its shape doesn’t do justice to the sauce. 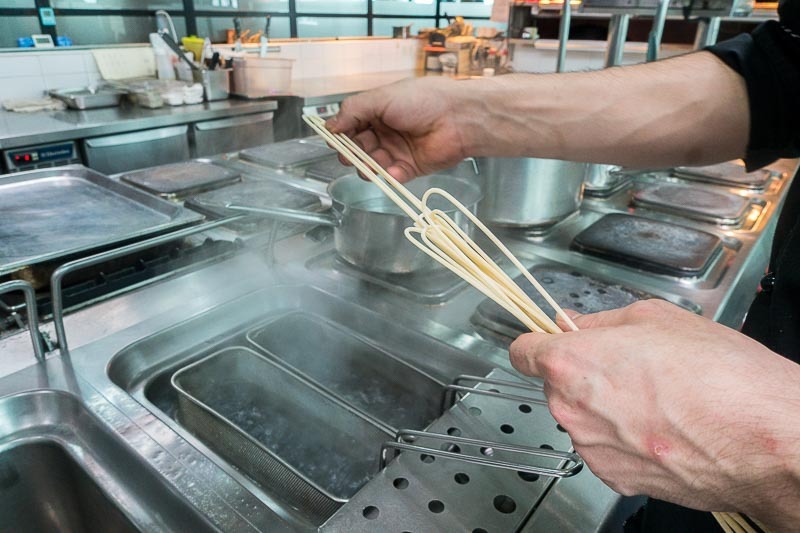 For example, when preparing carbonara sauce, you have to stir the sauce for some time for the raw egg to gradually thicken and cook. 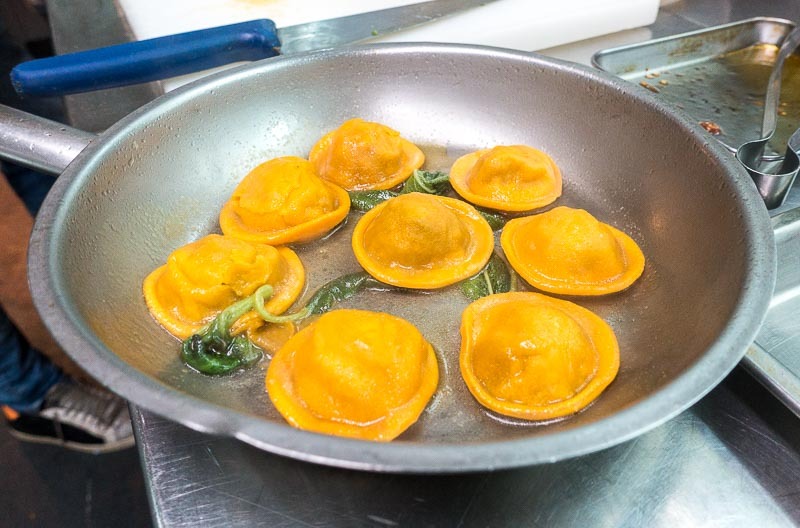 Should you choose to complement it with a pasta that is too thin, it would overcook very quickly and the egg would act as a viscous glue during the thickening process. 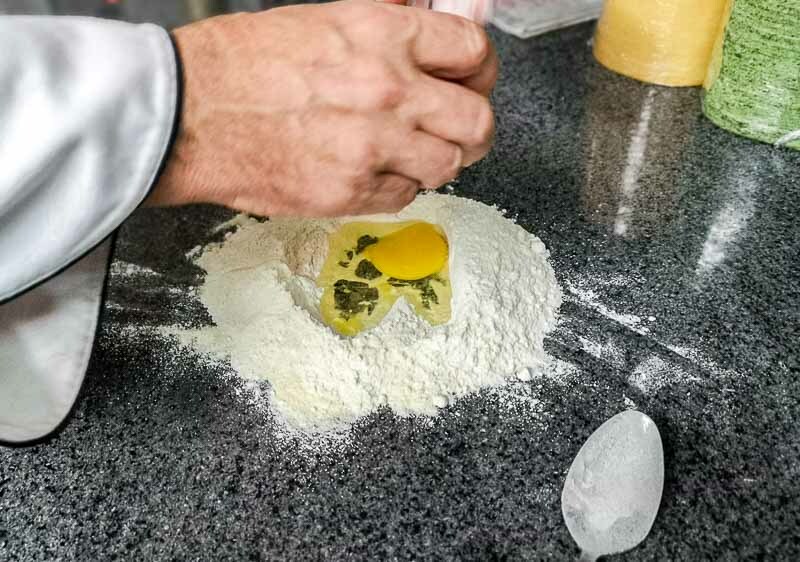 Besides the shape and texture of the pasta, few people realise that dry pasta and fresh pasta can affect how one enjoys certain sauces as well. Dry pasta is made with semolina flour, water and salt and can be stored at room temperature for at least a few years. It has a firm texture, ideal for casserole, soups and dishes with heartier sauces. Fresh pasta, on the other hand, is usually made from white flour, with eggs as a substitute for additional water to create extra moisture. Because of its soft, fragile texture, it is best with light sauces like tomato-based types, olive oil or butter. 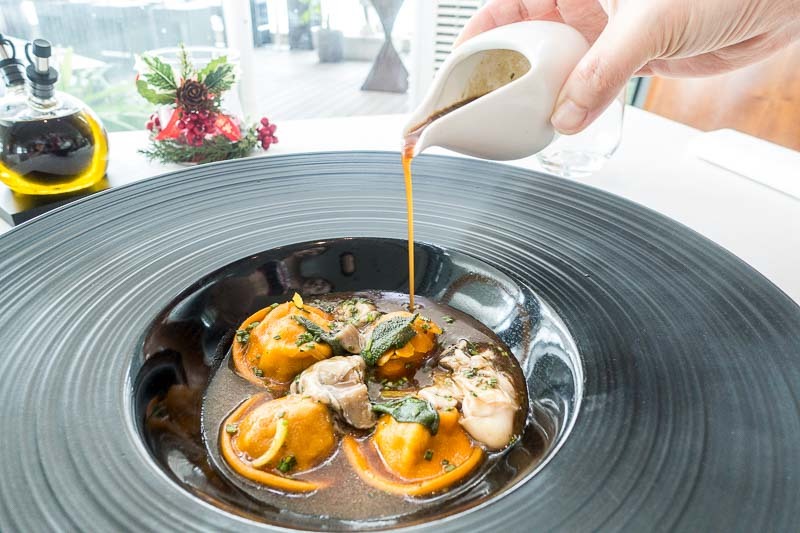 Another interesting fact I learnt from Chef Emanuele was that stuffed pasta that we’ve all come to know and love has various names, apart from ravioli. And naturally, what is stuffed into a ravioli is a deciding factor of what sauce you’d choose to go along with it. He prepared for us a Braised Veal Tongue Ravioli boasting meat that has been braised for six hours. Due to the dense flavours of the meat, the sauce was of a runny consistency using veal jus, soya sauce, oyster sauce, balsamic reduction, honey, ginger, white wine and vegetable stock. The special touch is the addition of oyster to the dish, making it a union of both land and sea. The flavours were not only unique but outstanding. I never thought veal and oysters could pair so excellently in a dish, that the saddest part was when everything had been polished off. I could taste the sweetness of the oyster even through the soya sauce, while the use of oyster sauce actually brought out the richness of the braised veal. Undoubtedly, next to pizza, pasta is a very strong contender for favourite Italian comfort food (at least in my books). It can be enjoyed many ways, and if you’re all about mixing things up and having fun with your food, the rules of pasta and sauce pairing may not even apply to you. I suppose it’s in this subjectivity of food appreciation that cuisines become fun and can reach a global recognition. Taste itself can be delivered in one way,but interpreted by countless palates, and that’s where personal preferences and crowd favourites curate what’s popular and what’s novel. No matter how you take your pasta, even if you’re a true-blue Italian, the joy of food should be something tremendously personal. Enjoy it the way your senses best comprehend, and you’ll always gain satisfaction from every meal.